I know it’s not Xmas – chill. This elf represents the power of sticking to what you believe in and the magic that can happen when you do that. So, this is the story of the Little Elf that Could – or better yet how Carol Aebersold was the? champion for this lovable little elf. As with anything, the elf began with an idea. Carol and her daughter Chandra created him to share the family tradition they loved so much with the world. To do that, they decided to publish a book and contacted publishers. The publishers didn’t love the idea. “Doomed for the damaged returns bin” and “based on this committee’s expertise to this?portion of the market, your book would not see a great deal of success.”- they wrote in rejection letters she received. Now, let me ask, if YOU received such rejection by authority figures – would you keep on going? Or would you let others stop you cold? Well, Carol and her daughter didn’t stop. 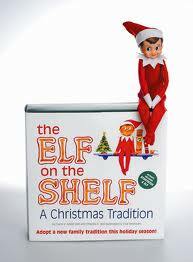 They stuck to their beliefs and self-published their book and had the little elf doll created to go along with it. And, once they did all that, they then had to had to market them as well. It didn’t just become an instant hit. They began with a book signing in which they invited 200 people. That was just the beginning of an intense marketing campaign in which they worked tirelessly to share their little elf with the world. They didn’t quit when it got hard, they didn’t let other people’s discouraging comments stop them. They didn’t give up. Today – the Elf on the Shelf is a multi-million dollar brand. That’s a true testament to the power of sticking up for your dream. Congratulations Carol and team on your accomplishment!! You’re my inspiration of the day. If you’ve ever had anyone shoot down your dreams, tell me about it in the comments, I’d love to hear your story. The X-Factor – Secretariat had it – Do you? and the Belmont Stakes. That alone should have proved he had the X Factor, right? in a way that makes you stand out and be remembered. on the track to win it. other horses were slowing down. had both hands on the reins. horse racing. In the Belmont, there were only 4 other horses even entered. there until the first turn when he was overtaken by Sham for a couple of seconds. horses, he was racing into history, winning the 1 1/2 mile race in just 2 minutes 24 seconds. Not only did Secretariat win the Triple Crown – but he shattered the track record and set his own for each race. And, that is the X Factor at work. What can you learn from this? Use your natural talent to it’s best ability. Run YOUR race, don’t look back, and don’t race against others. and all the peeps gathering for another JV Alert Live. in person – I’m looking forward to that. purposes of this fantastic event.